Power is about control and authority which limits people. Process is about faster, higher and stronger which spins people faster. Project is about moving which changes people. All three forces together can have a quite severe impact on on people. Literally they force people to change faster and faster while limiting them. Increase the power by climbing the hierarchy. Forcing others to spin faster, higher and stronger by becoming process owner. Forcing others to change by executing projects. The easiest way to escape lies in executing projects, be it as internal or as external. Being good at project execution protects people against being forced to change themselves, because the methodology on how the project was executed can be used again and again and again without adapting much. Furthermore if implementing a specific solution that very same solution with small adaptions can also be implemented many times in a row allowing to not change while those who are affected by the project must change. Being really strong in one methodology sometimes opens up for the chance to become process owner, which is great, because it allows to let other people spin faster (and higher and stronger), while the own speed more or less remains the same (except if the process owner of process management really makes process managers spin faster). Rising in the hierarchy is the option in which typically the people are interested most. First of all it is the option which has the highest chance to increase income significant. And it is (and makes) attractive, because it gives direct power over others. 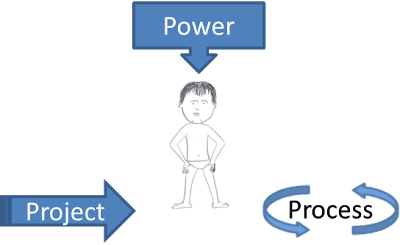 The interesting (and potentially relevant) observation I make in most cases is that one who is advancing either in Project, Process or Power terms is normally picking up the behaviour of who was leading him in respect to that particular force. It takes some time to free up and leave the old approaches behind and actually many who are in the position to control one of the forces never advance.